(CNN) -- Ravi Bopara scored his third century in successive Test innings as he and Alastair Cook put England in control on the first day of the second Test against West Indies at a chilly Durham on Thursday. 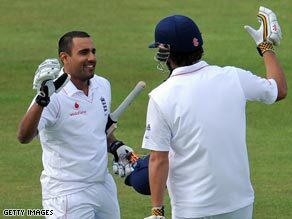 Bopara (left) and Cook took the West Indies attack apart on the opening day of the second Test. Bopara became only the fifth England player to achieve the feat -- added his name to a list containing four all-time greats, Herbert Sutcliffe, Denis Compton, Geoff Boycott and Graham Gooch -- as England racked up 302 for two. Bopara scored 108, with his Essex team-mate Cook unbeaten on 126, as the pair put on 213 runs for the second wicket to effectively put the match out of reach of the tourists -- who need to win to level the two-match series following their defeat at Lord's. Cook reached his ninth Test hundred shortly before Bopara's third. Left-hander Cook hit 11 boundaries from 209 balls, while number three Bopara reached his notable milestone with 12 fours and a six from 183. Captain Andrew Strauss was the first of England's two wickets to fall on Thursday when he gloved the ball to wicket-keeper Denesh Ramdin, off opposite number Chris Gayle, for 26. The only other highlight for the tourists, on a day when their bowlers took a hammering, came when paceman Lionel Baker produced a superb delivery to nip back and knock off Bopara's bail.